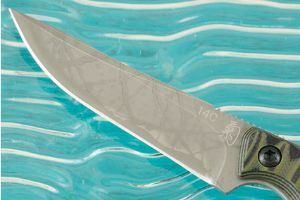 Description: Renowned Japanese knifemaker Kikuo Matsuda has been grinding blades for over 40 years and is a 5th generation knife grinder. 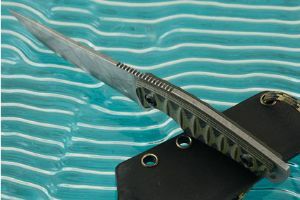 His unique, dramatic grinds are well known throughout the knife industry. His father runs a small workshop in Seki, grinding blades for production knife makers. Kiku learned grinding techniques from his father. Kikuo's skill at the grinder has become legendary. In his spare time, and when Kikuo travels the world visiting knife shows, after the show, he is often found in local rivers fishing. 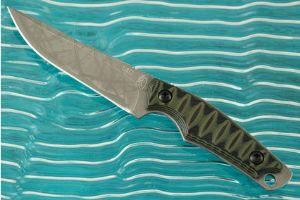 It is one of his passions and inspires many of his knife designs. 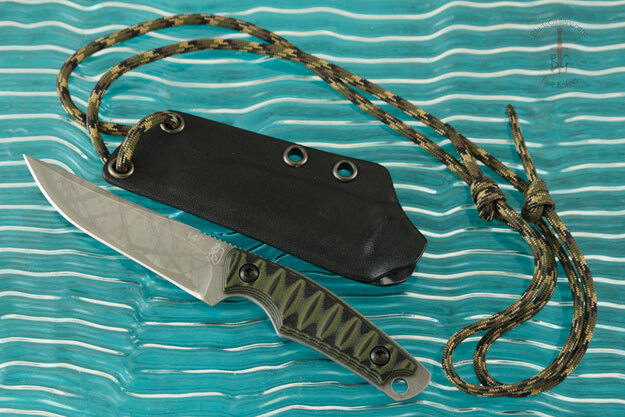 This fisherman's utility knife is designed to easily clean fish while out in the field. It is named after the Momose-Gawa, his favorite mountain stream for fishing. It is a handy size, light and thin profiled, making it easy to carry. 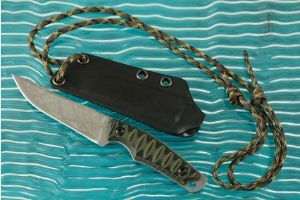 The Kydex sheath can be worn either on the belt or as a convenient all-around neck knife. The blade is formed from Sandvic 14C28N stainless steel, making it easy to use around water. The thin (.1") blade stock, swedge, perfectly placed choil provides a perfect balance and make it an excellent choice as a utility. The jimped spine has a slight swayback, providing very precise control of the tip. 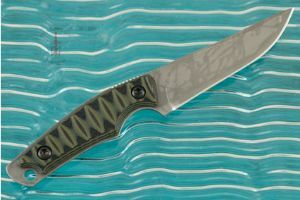 It is quite impressive how much extra dexterity such a subtle detail adds to this knife. Whether you are fishing, camping, or walking through the urban jungle, this knife is a prime example of Kiku Knives' multi-functional versatility. 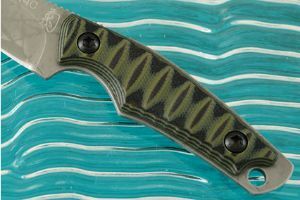 Camouflage G-10 scales are set on a full tang for strength and durability. The 3D contoured handle provides a comfortable, non-slip grip.